We're back! We know it's been a little while since the last update, but everyone has been working hard behind the scenes. First off, we have a release date for Backer Build One: May 1st. This is a month later than we had originally planned, and we're really sorry for the delay. While every effort was made to meet our original Q1 estimate, we wanted to make sure we could deliver the best possible version. One of the reasons for the delay is to implement the inventory system. We feel that this is a key mechanic for Phoenix Point, so wanted it to be included with Backer Build One. Back in February, Snapshot Games attended the PC Gamer Weekender show in London. Guests of the show were able to meet with Julian and other members of the team, along with having the chance to play our tactical demo. The demo is a small taste of what there is to look forward to. A single scenario where guests got to try their hand at Phoenix Point, taking control of the New Jericho faction in defense of a Haven. There were unfortunately some features that we weren't able to squeeze into the demo in time for the show (such as the Technician class and the drivable vehicles) but we are working to get them included for next time. If you weren't able to attend PC Gamer Weekender, you can watch a play-through of the demo below. In April we will be attending EGX Rezzed, also in London. The show dates are Friday April 13th to Sunday April 15th. Snapshot Games will be there on all three days with the demo build. If you're attending, seek us out and try it for yourself. Tickets for EGX Rezzed are still currently available, but running low. Get your tickets here. One of the features we're most excited about in Phoenix Point is the mutation system. Each enemy (including the boss creatures) has the ability to mutate and throw new challenges at the player. Enemies will have a variety of different heads, torsos, arms, legs (and various other limbs) that can be used together in different combinations. Each different body part will provide different skills and abilities to the enemy, along with some straight up statistical modifiers such as increased speed or armour. For each creature, each body part will have a distinct look. 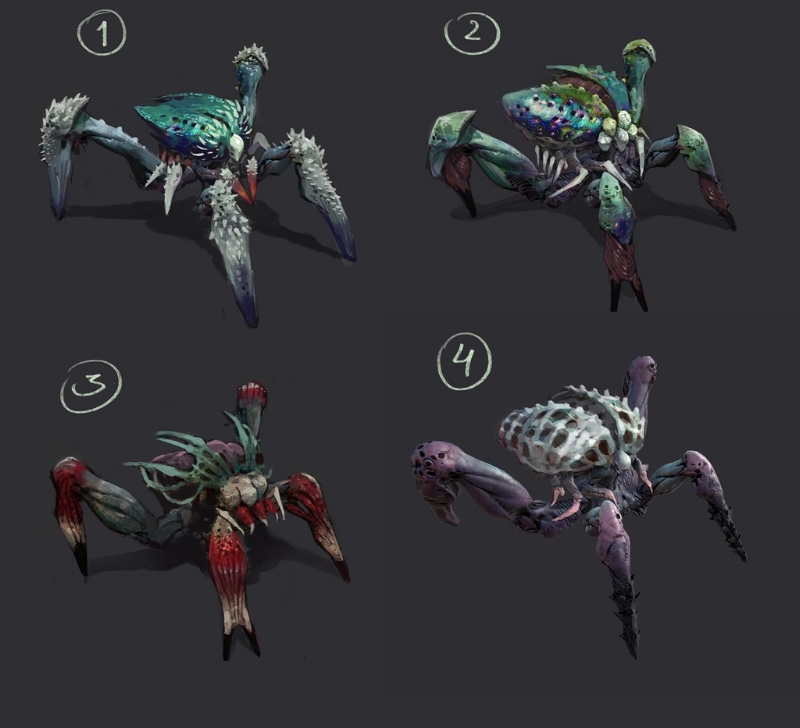 Following the philosophy that players should be able to distinguish and identify different units from their models, the different mutations will have a lot of visual variety. 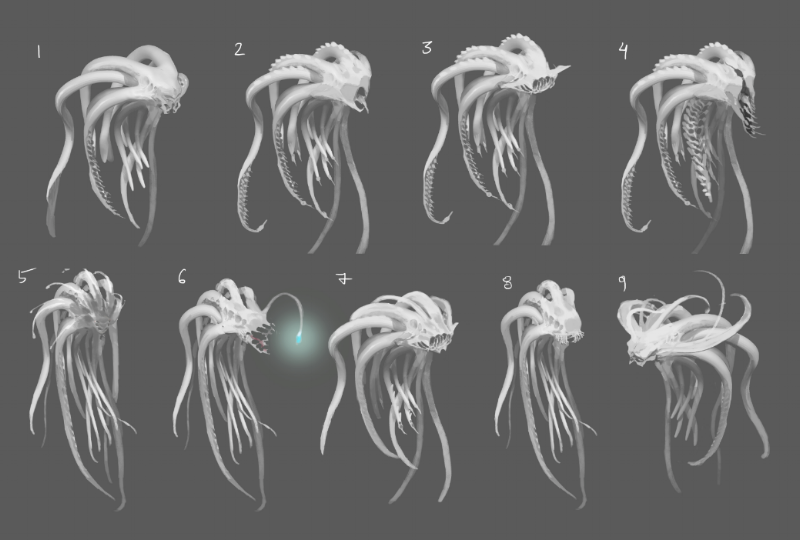 Below are some examples of the huge number of visual variations the art team were able to imagine. As always, a lot of this imagry is concept work and may or may not appear in the final game as shown. Above you can see four different variation combinations for the Chiron creature. Notice the different use of legs, torsos and heads which can all be used interchangeably creating some very distinct visual differences. The examples above are just a small selection from a huge sheet of different designs. There's already a lot of different variation in how they look (and in their abilities - but we're not going to reveal too many secrets here). Here's a few more for you. That's enough of the Chiron for now. Let's take a look at something else. 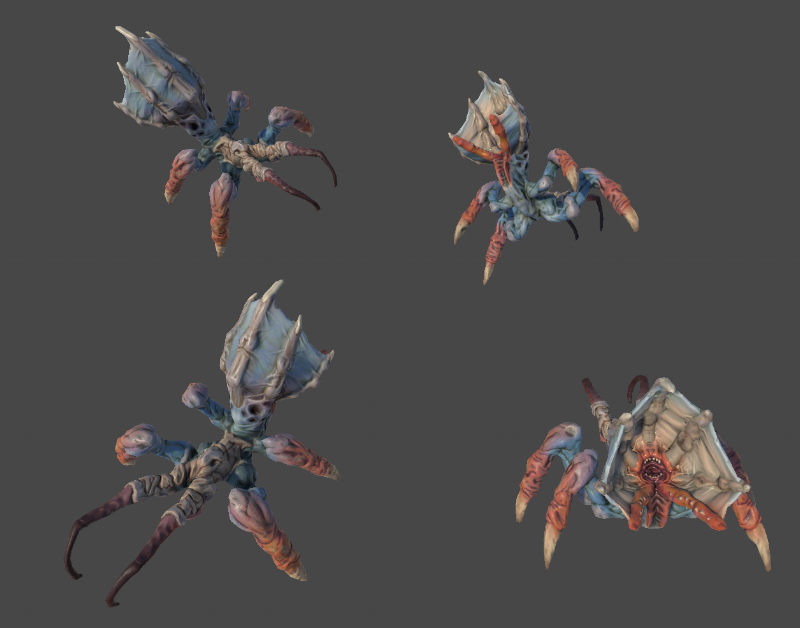 Most of you will have seen the Crab Queen boss who features in our demo and trailers. Above you can see some concept work for some of her different head variations. Speaking of the Queen.... one thing that we didn't quite manage to get into the tactical demo was the redesign of the Crab Queen's larva. Something that we've mentioned a few times before is the Mutog - a mutated dog which can be controlled by the Disciple of Anu Mutog Handler class. 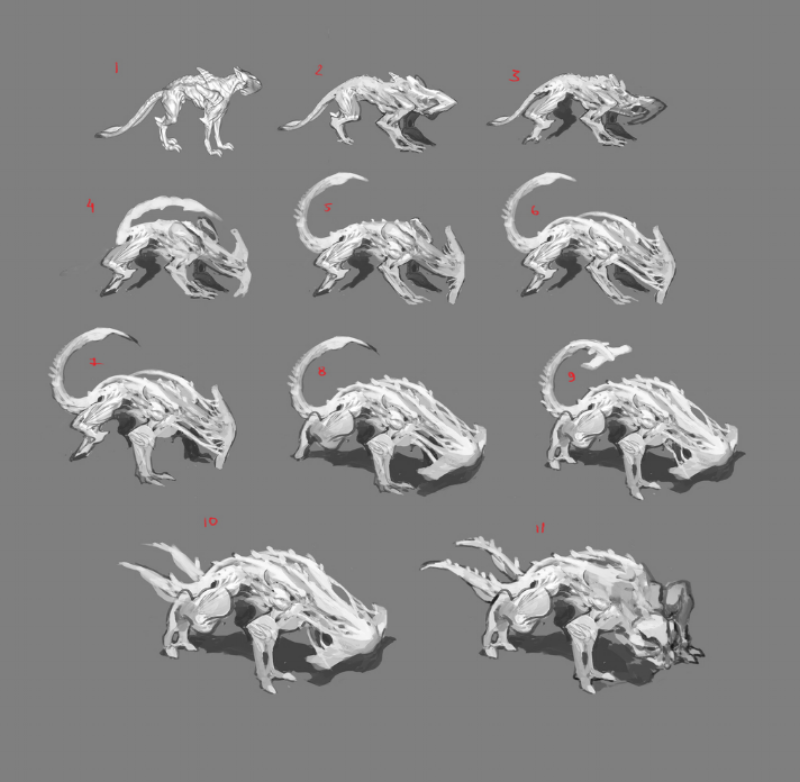 The design and art team are also constantly working on new creature types and variations, such as the floating creature below. Here's an example of one of those variations with colour and texture applied. There are many more creatures and variations. We'd love to show them all, but we don't want to spoil the surprise. All of this concept work and much, much more will be available in the Phoenix Point Art Book which is available as a digital PDF with the Luxury Digital Edition and above, and a physical hardbound book with the Collector's Edition and above. The Snapshot Games family has increased in size again in 2018. Here is a quick rundown of the latest members. Simeon joined Snapshot Games towards the end of 2017 as our in-house sound designer. He's responsible for all of the sound effects which you will hear in the game (including our tactical combat demo). He's also the composer of the music heard in the demo, along with being the voice of the Crabmen! Previously, Simeon has produced the music for some Bulgarian movies, spent 8 years working on sound design for casino games and has been a DJ and musician for over 10 years. He enjoys Fallout, Skyrim, The Void, Planetside 2 and Doom. Vanya joined the Snapshot Games team in February as a generalist 3D artist. She works on environmental art, character models and textures. Previously, Vanya worked at Ubisoft Sofia as a level and environmental artist on Assassin's Creed Origins and The Curse of the Pharaohs DLC. Vanya's favourite game is Doom, but she also enjoys Destiny 2, Overwatch, Fallout 4, Uncharted, Quake and League of Legends. The New Jericho residential buildings are what Vanya is working on currently. Nikola joined the team in January as a programmer. He works on a wide range of things from general gameplay, UI functionality, ability mechanics and camera control. Nikola previously worked for Gameloft on a number of titles. His favourite games include Total War, Surviving Mars and XCOM. Nikola is currently working on the free-aiming system of Phoenix Point. Kamen also joined the Snapshot Games team in January as an FX Artist. He works on a number of systems within Phoenix Point including environmental visual effects, the UI, camera control and animations. Kamen has a background in the VFX industry and worked on movies such as Rambo, Immortals and Life of Pi. His favourite games are the original X-Com series, Fallout 1 & 2, Diablo 1 & 2, Quake and Mass Effect. Kamen is currently working on the animation pipeline before moving onto The Mist! Georgi joined the team at the beginning of the year as a 3D Character Artist.